All audio engineers have their “set up tracks”— music tracks that we play to get a public address system (PA) to sound just right in any given room. First we set up the speakers to perform at their best by using all kinds of great software and special measurement microphones, equipment that shows us (via graphs and frequency traces) exactly what is going on with the acoustics in the room. But after we finish with all that fancy stuff, we put it away and get out our little iPods, and play our personally chosen set up tracks over the PA system. While listening to these tracks, we can hear what final adjustments need to be made so that the PA sounds as close to perfect as possible. Different engineers use different tracks, and these tracks are often similar to the kind of music they will be mixing that night. But there are a few of us who use the same tracks in every situation, no matter what. I’m one of those. My set up tracks are always from “ Vision – The Music of Hildegard von Bingen.” This 16 track CD collection was created by an accomplished composer and musician named Richard Souther. He has taken Hildegard’s ancient melodies and placed them within accessible contemporary arrangements, thus making her music more appealing to people most comfortable with pop or new age styles. There aren’t a lot of people around these days who relish the traditional presentation of Medieval antiphons and repositories, what with the free pitch, lack of repetition, and less than constant rhythms. No, you can’t really dance to those ancient tunes. For setting up a PA, the “Vision.” tracks are perfect for many reasons, not the least of which is that hearing the CD puts me in mind of the sacred. It reminds me that even sitting behind all my machines and wrangling electrons I am still doing divine work. Illumination from the Liber Scivias showing Hildegard receiving a vision and dictating to her scribe and secretary. But the technical reason is that this CD is mixed perfectly. The focus is on the vocal lines. The frequencies specific to the human voice generally remain beautifully free in the mix. The accompaniment lows are clean and deep, the highs are tight and rich with somewhat exaggerated transients (the very high frequencies that give a guitar string its tiny almost imperceptible “snap” right when it’s plucked or strummed). The accompaniment doesn’t fight the vocals, instead the voice is cradled and surrounded, as the synthesizers swirl and dance. To me, it’s one of the coolest CDs ever created, and almost 20 years after I bought it I still listen to it all the time. It’s my go to CD when my mind is racing, when I want to draw my attention back to the sacredness of this place and time. When I played some tracks from this CD as background music during a writing mediation at a CFT Indiana retreat, Barb Crews said, “WHAT music was that? It felt like it was sweeping me away!” And that’s exactly what this music does. You are held, supported by the accompaniment, but your awareness literally soars on the breath of the amazing vocal work of Emily Van Evera and Sister Germaine Fritz, OSB. Hildegard’s words are in Latin, and translated I can glimpse a little of her philosophical genius. But for me, I find the magic in her melody. It’s a soft stream flowing over rocks and roots, carrying leaves and tiny insects along, sparkling in sunlight, reflecting the sky. There’s something so holy, and so, well, feminine about it. It’s magic stuff, and if you love music, her work is intoxicating in a way I can’t really explain. And to think she composed these melodies more than 800 years ago! Not everybody loves Mr. Souther’s contemporary arrangements. 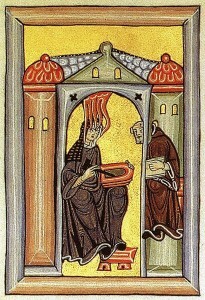 Some classical critics and academics feel that Hildegard’s music should be performed as closely as possible to how it would have been at the time of its creation. 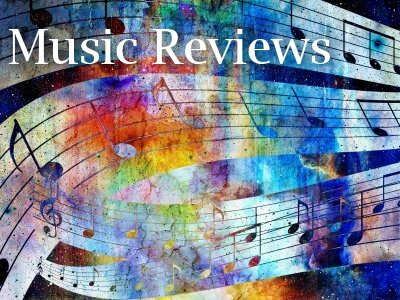 And honestly, it takes more than simple changes to make medieval music, written in modes very unfamiliar and sometimes uncomfortable to our modern ears, sit well with a pop or new age format. Contemporary pop and new age musical styles require a redundancy of phrase and melody totally foreign to the way music was written in Hildegard’s time. Souther doesn’t hold back, he edits, cuts, copies and reshapes phrases and lines. His creative synthizer textures are often decidedly electronic, but also rooted in acoustic timbres, complementing the organic suggestion already present in the melody. This explains how his synth patches can sound fresh, not dated, even twenty years after the sounds were programmed. Quite remarkable. To my ears and mind, Souther’s efforts are deeply rewarding. Through his work I can experience Hildegard’s music in a way that engages my heart, mind, and senses. The solo vocal recordings of her music that I own (and I own several) engage my heart and mind, and are beautiful and calming. But Souther’s interpretations additionally engage me bodily, proving to be invigorating and also entrancing. Hildegard von Bingen’s alphabet Litterae ignotae. Collage of a scan of an 12th. c. manuscript. If you don’t know much about Hildegard or her work, it would be worth doing a little reading about her life. Hildegard was one cool woman! She was skilled in healing, music, and writing. She invented an alphabet and created new words used in her writing and lyrics. She went on several speaking tours during a time when women religious were expected to stay hidden from society. Her theology centered around a concept she referred to as “Viriditas.” This term literally translated means “greenness.” She saw this growth, this “greenness,” as a non-dualistic metaphorical expression of divine nature. Musically, Hildegard stretched the composition of her day further than anyone else, utilizing wider intervals between pitches than was common, and writing flowing, lilting melodies which required a much wider vocal range than is evidenced in the other surviving works of her time. Bruce Holsinger, a professor at the University of Virginia, has written in his book, Music, Body, and Desire in Medieval Culture: Hildegard of Bingen to Chaucer, that Hildegard’s lyrics and melodies were an expression of sexuality centered around the female body, womb, and virgin community. Pretty cool indeed! 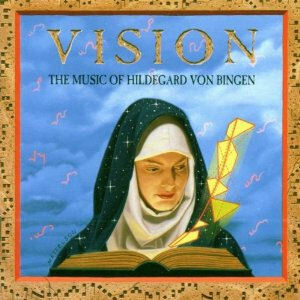 “Vision – The Music of Hildegard von Bingen” won the Billboard Classical/Crossover album of the year award in 1994. Richard Souther’s CD, even though it’s almost 20 years old, has held up beautifully. I urge you to listen to the title track on You Tube. If you like it, you’ll love the rest of the CD and you’ll enjoy it for years to come. And buy the physical CD instead of the download; the included 32 page booklet is an excellent resource about the composer/arranger, the vocalists, the life of Hildegard, and how this CD came to be made. Richard Souther created a follow up album in 1997, “Illumination,” with 14 new arrangements of Hildegard’s music. Learn more about Richard Souther’s work on his website. If the contemporary arrangement seems a bit much, don’t give up on Hildegard’s music! Here’s another recording of one of Hildegard’s pieces, presented much more traditionally with just a solo voice, and a very simple accompaniment. And finally, you can enjoy the entire Annonymous 4 CD collection of Hildegard’s music, “The Origin of Fire” on YouTube. Click here to listen to Hildegard’s music performed acapella by this world renowned quartet of female vocalists. I am so thankful for the honor given to these biblical women by these poems. This collection, spoken through the voices of women in both testaments, puts flesh and energy into what have too often become stale stories from our early Sunday School days—if we heard them there at all.